Malvern~~ You might recall that attending the Malvern Spring Garden Show started out as an off the cuff comment to VP in the early days of Meet@Malvern and quickly morphed into Frances and I booking our flight while chatting on the phone...There was never a moment of doubt that this trip was going to be the best ever for two innocents like us! Packing was the funniest task~ Please picture me trying on clothing for an English spring in our 80 F weather. I was dressed in corduroy pants with sweat running down my face. In complete denial, I packed tissue tees and at the last minute grabbed a wool sweater and added it to the already over stuffed luggage! Volcanic ash (Can You Say 'Eyjafjallajokull'?) cooperated and before we knew it we were happy little sardines on our red eye flight to the UK. London~What a wonderful city and thanks to Ralph, a dear friend of the Financier and Frances, we had a delightful overnight stay. Ralph is forever my hero...He gave us a tour of his neighborhood, took us for a walk at Hampstead Heath, provided wonderful accommodations and fed us a delicious dinner. He humored our need to shop and took us to a sweet store off a charming street where we indulged in our love of scarves! One of us indulged way more then the other! The next day we were speeding toward the Malvern Garden Show! The countryside went by in a dirty window blur and we were still enchanted~Those rich yellow fields were every where and turned out to be Brassica napus with the unfortunate common name of rapeseed. Also, unfortunate~ this plant has become part of an international controversy over global patent protection of genetically modified crops. But, that's for another post! London, gorgeous gardens, pretty countryside were all wonderful treats...But, the best treat of all was stepping off the train and into an adventure of friendship. 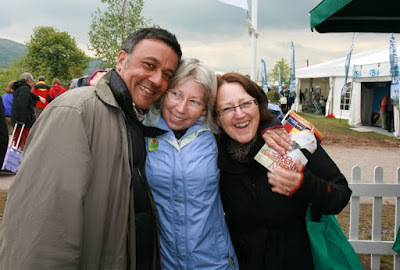 Here are the Two Innocents with Cleve, aka, he who smolders, hanging out at the Bloggers Meeting Point that was kindly provided by the Malvern Show organizers. Thank you Arabella Sock for the use of the photo. Here's a Sorority group shot in our fantastic digs. Top Row from left~ Yolanda-Bliss, Frances-fairegarden and Ewa-Ewa In The Garden. Bottom row from left, VP-Veg Plotting, Victoria-Victoria's Backyard and me. Missing is Helen-Patient Gardener. The show was really fun. It was cold and windy with occasional rain. I had been thinking all day and perhaps had even mentioned once or twice to Frances, how impressive the Malvern Show was. So when VP asked me what I thought of the whole experience...I enthused that Malvern was how a garden show ought to be. The Flower Marquee was incredibly impressive. Imagine a warehouse sized tent filled with nursery exhibits and thousands of plants for sale. Hidden behind were trucks filled to capacity for restocking. from Hampshire Carnivorous Plants~I was in total awe! 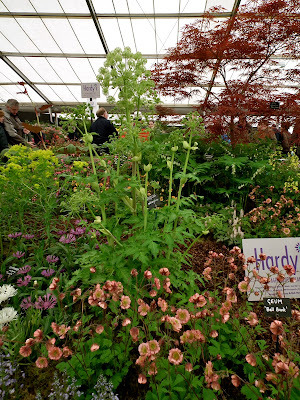 Tempting plants like these geums~We sighed over them! Lively entertainment from Three Men Who Went To Mow~We laughed with them! Freebies for the bloggers from Wiggly Wigglers ~We are really appreciative. This is only the first course; there's more to come...Can you bear the excitement! I promise the gardens are sure to please. Dear Gail, what an adventure we shared! And how nice that the volcano alllowed us to make the trip and return home somewhat on time, just a small window of opportunity, it seems. We are still savouring the moments, smiling at the photos and remembering the people we met. It was truly the trip of a lifetime, and you were, as always, the best of travel companions! That first photo is poster-worthy. I enjoyed enlarging all the photos, especially the carnivorous plants - what a great collection. I look forward to your later posts. It sounds like you were mightly blessed on this trip. Everyone needs a Ralph when they land in a foreign country to help them get their sea legs or in this instance scarves. Can't wait to see the gardens. I've just come from Frances', Gail, and I feel as though I've been transported for a brief while to England with the two of you. What marvelous displays of gardening, and how much fun meeting up with all these bloggers from across the pond. This is a trip you'll remember for a lifetime! Gail, I so enjoyed this post. I've always wanted to go to England! Sure looks like you two had fun! I was wondering if the volcano had been an issue. Glad to hear it wasn't! don't you grow rapeseed in America? Looks like fun...can't wait to see more! Gail, I miss you, please come back soon! So glad the volcanic ash let us all go to the Uk and back home again although I wouldn't have minded staying another week at the Lighthouse due to volcanic ash. You? It looks like you had a wonderful trip. I love England, and one day I'll do a garden tour of my own. Sounds like a great trip! Can't wait to see more of your adventures. I'm surrounded by that rapeseed no wonder I'm on allergy tablets just now - it even seeds in the garden here if you're not careful - but its a bit like an overgrown wallflower when you see it up close. Glad you had a great time over here despite the weather. Oh Gail - I miss you! Come back soon! (do I echo Yolanda?). It was wonderful time we had together, entire two weeks wouldn't be enough. GAil: It sounds like a great trip and love the pictures. What fun! We need to talk. Love the arbor and meeting the others, of course. I can just hear you and Frances discussing all you saw and just having a great time. How long did it take you to place all those sheep? 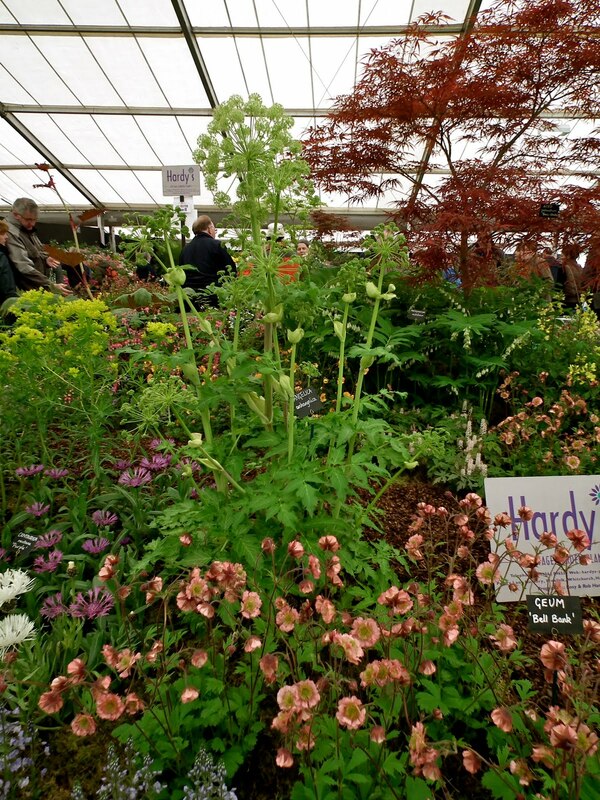 Or perhaps they're more clever than ours and just move in perfect formation....probably the latter based on all the marv garden plants/displays you saw....everything just seems better there. The oil processing companies call rapeseed here Canola - Canadian oil. Lovely to read your post and hear what a wonderful time you had. How wonderful that you all got to stay together! I'm sure that was quite fun! I look forward to seeing the gardens! P.S. Just had to say delicious first course... looking forward to the next! Oh how fun Gail....what an adventure! Can't wait to hear more. Love, love, love the arbor! It was so great to meet you and so good to read your blog about it all too. I love the reward for the adventurous spirit you both showed! what an amazing report on your trip! Glad you gals had such a great time! I am trying to see your fantastic photos on my tiny iPod. If I can wrestle the iPad away from my husband, I can get a better look! Gail, I can hardly bear it! I find myself nearly crying cause I wanted to be with all of you so badly and then laughing at some of your sweet jokes (he who smolders indeed). Thank you for the update. Will wait ever so patiently for more. Just Magical! It really is all we hoped and more! Thanks for sharing. So lovely and how wonderful to meet other bloggers there. I'm enjoying this vicariously! I have so many comments! I remember the fields of rapeseed from a journey 20 years ago--it was beautiful. Finally, a picture of the elusive Yolanda Elizabet! Your pics are gorgeous; I love that London street. I'm very envious of your trip, and I also can't help wondering if you ever could have guessed where garden blogging would take you? 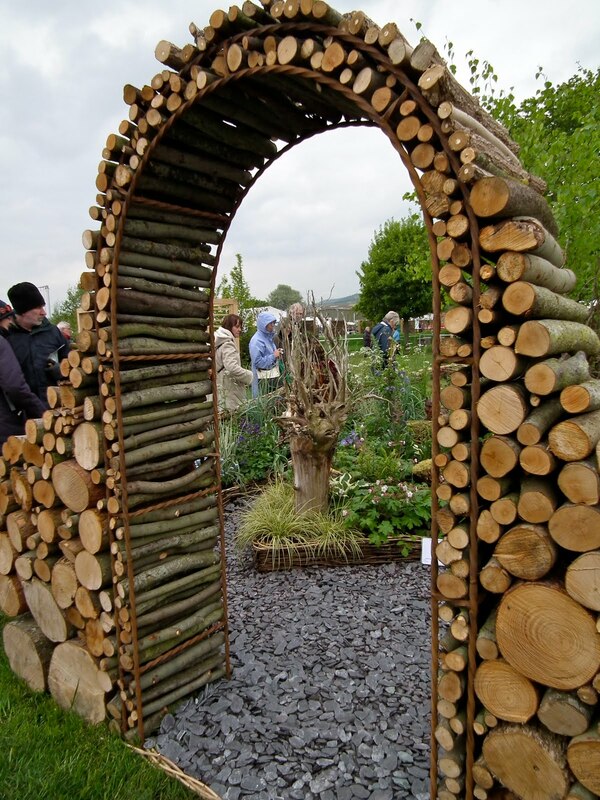 And that log arbor--love it! What fun! I enjoyed reading about it and looking at your photos. Love the excitement with you & Frances. I know you had a ball. Love all the pics & can't wait for another dish of joy. I've been watching for this first post to get a glimpse at the 'dream come true' for you and Frances. The first photo is delicious as were the garden show photos. So fun to see some of the friends from across the pond getting together with our stateside friends. I wondered about Cheryl (wildlife sanctuary) ... did you get to meet her? What fun pics and how nice to put faces to names! Looks like you had a wonderful time! The carnivorous plant display is amazing! It looks like a fantasy forest. I love reading this and the posts to come. So great that you got to meet our across-the-pond blogging friends too. Which reminds me, won't be long until we're in Buffalo! Gail, how exciting for you to be here/there and how fun for us to get to see you there! Very fun seeing photos of some of my favorite garden bloggers, plus getting introduced to 3 Men Who Mow. I guess the advantage to travelling across an ocean to a garden show is - that's one show where you really CAN'T buy a lot of plants (when you already have lots that need to be put in. Or perhaps I project). Ooh... what a great introduction. I can't wait to hear all the rest! Hi Gail, I can sense your excitement. What fun it must have been, although a bit torturous too--not being able to bring home any of those stunning plants. I was thinking the same thing as Blackswamp about TDH [tall, dark and handsome] Cleve! And a British accent? What a fun thing to do--meet up at an English garden show... It seems beyond reach, but you showed that it's not. So how do I get you and Frances out to California? We have a guest room...not as fabulous as where you stayed, I'm afraid. Well, there aren't any volcanoes to stop you. Dear Gail - I still miss you! Lovely to see the show and our sority house through your eyes. Now why didn't I think of taking a picture looking down into the lounge especially when Victoria was playing the piano? Heavens, the Lighthouse looks wonderful. I'm surprised you could drag yourself out to the show! Very nice to meet you at Malvern. It was all a bit overwhelming so I didn't do as much chatting as I should have done. What a treat you had and have given us! I went through Malvern on a train last summer on my first trip to Britain. The area is stunning and wow, what a garden show. I can't get over those pitcher plants! Thank you! What a wonderful trip Gail - how lucky you and Frances are to have been there to meet and spend time with European friends and visit such fantastic gardens.